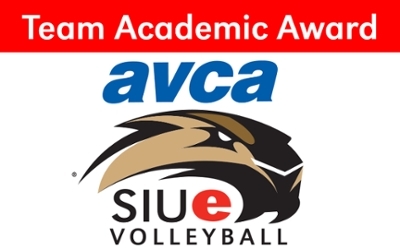 The SIUE volleyball team gained national recognition with the awarding of the Team Academic Award by the American Volleyball Coaches Association (AVCA). SIUE was one of 131 NCAA Division I programs honored for the 2015 season. “There's something exceptional about performance on the court, but when you know the level at which the players perform in the classroom, especially in-season, it separates programs," said SIUE Head Coach Leah Johnson. The award, which was initiated in the 1992-93 academic year, honors collegiate and high school volleyball teams that displayed excellence in the classroom during the school year by maintaining at least a 3.30 cumulative team grade-point average on a 4.0 scale or a 4.1 cumulative team GPA on a 5.0 scale. Eleven volleyball Cougars earned a grade point average of 3.3 or better during the 2015-16 school year. They are Emily Harrison, Taylor Held, Taylor Joens, Samantha Knight, Mallory Mangun, Kaitlyn O'Reilly, Carley Ramich, Jackie Scott, Katie Shashack, Alicia Streetar and Kristen Torre. The SIUE volleyball team posted the highest team GPA among SIUE teams in both the fall 2015 semester and the spring 2016 semester. The SIUE volleyball program opens the 2016 season in late August at the Wright State Tournament in Dayton, Ohio.